The shear size and power of these sea run char has to be experienced to be believed! 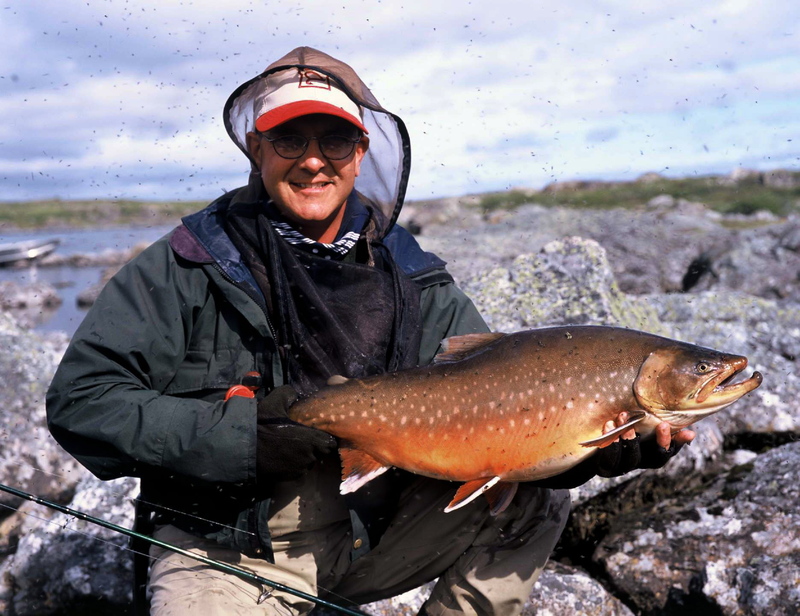 In Ungava Bay a two hours flight north of Montreal in Quebec, swim the worlds largest Arctic char. Don’t expect too much of the cabin! these are the last worlds of the legendary bush pilot Johnny May as we unload the last of our gear from the plane and he wishes us farewell with a smile. 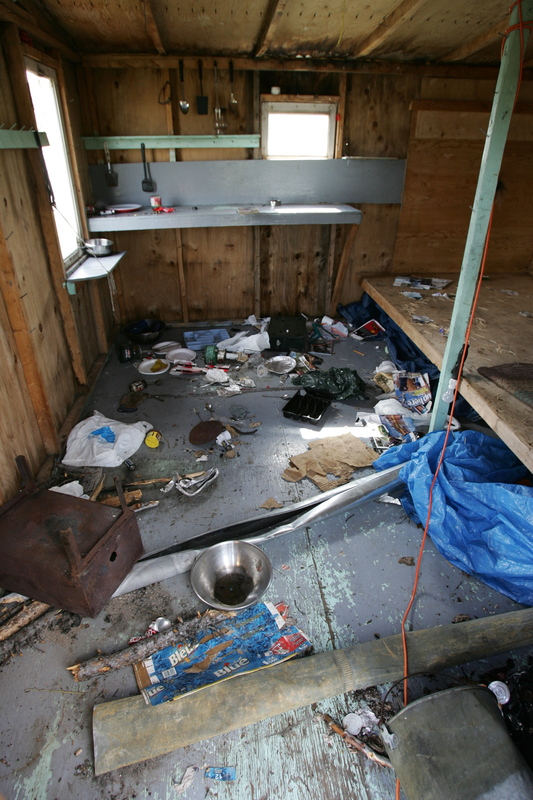 We don´t really care about the condition of a cabin as long as his stories about char of 7, 8 and 9 kilos are for real. We climb aboard a bright red De Havilland DHC-3 Otter – better known as a Single Otter. A few minutes later our bush-pilot, Jonny´s brother Billy, throttles up and accelerates against the wind. Then the planes pontoons lift of the water, we are on our way from Kuujjuaq, to the Arctic Char adventure on the Nunavik tundra. After three quarters of an hour flying over the endless tundra and endless lakes and rivers, we finally get to our destination which is the small river that runs out from Lake Dulhut out into the powerful Pelledeu River. When Billy makes a sharp turn to land against the wind I see the flash of white tipped red fins in the clear water beneath us. Jon, my fishing companion who has been Billy´s co-pilot turns to me with his cap on backwards and gives me the thumbs up. We have been travelling for three days, Oslo – London – Montreal – Kuujiuaq – Dulhut and now he is suffering from a very high fishing fever. The only cure is a fix of Arctic char, and he needs it quick. The hut afetr a visit from a Black bear. First when the August night came rolling in over the tundra and the glow of the cleaned-up campfire was dying out we are ready to fish. In a small waterfall which was only two flycasts north of the cabin Jon hooked a very powerful fish on his first cast. 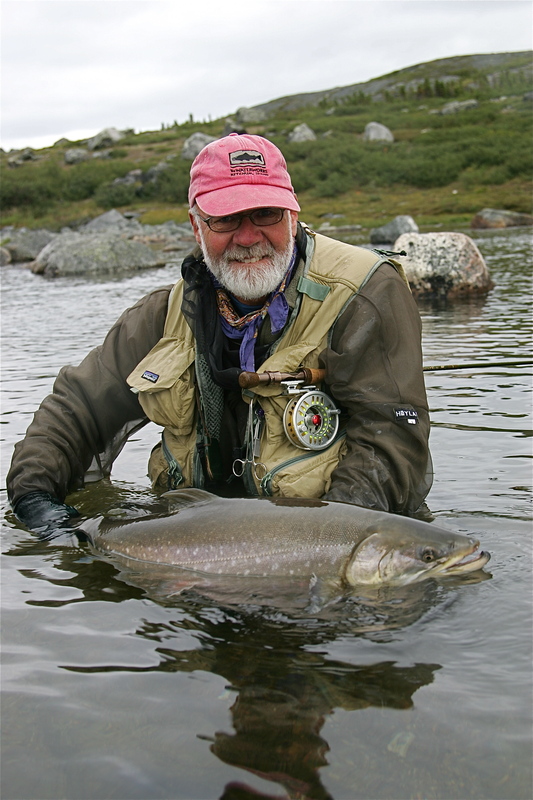 From my previous experience of fishing these Arctic giants, they not only refuse large flies but they are spooked by them. Jon’s first fish took the size 14 shrimp imitation in orange glimmer chenille and had total control for the first few minutes. 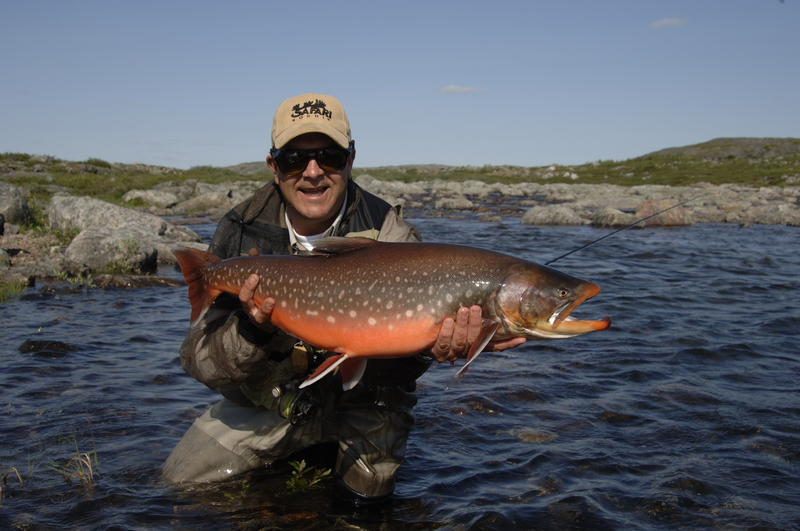 His #7 rod was bent deep into the handle under the power of this mighty fish..
Having caught a few fish we had the fever under control and more important it had been confirmed that Dulhut could offer world class Arctic Char fishing. After a breakfast of toasted white bread and scrambled eggs, we spend the first half of the day in the river mouth just above the cottage. 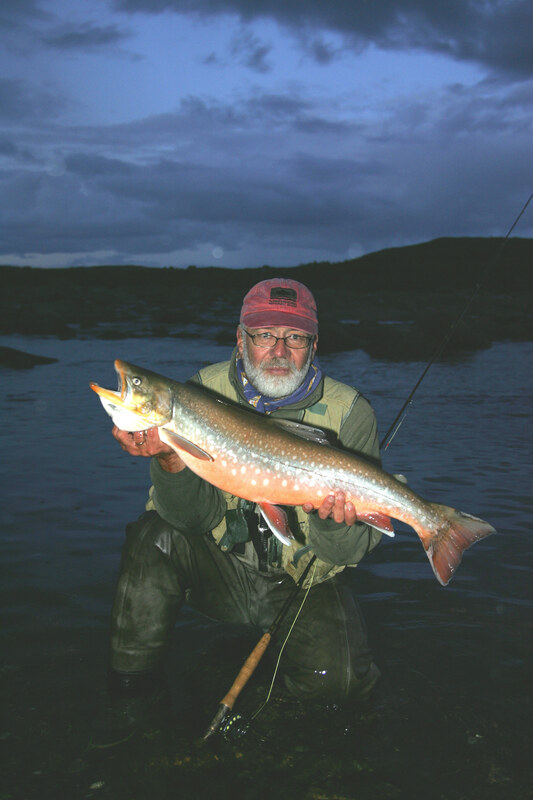 We fished with the same flies as the evening before but soon realised that the fishing was even better if we fished a bit deeper – as we fish for char in Norway and Iceland. 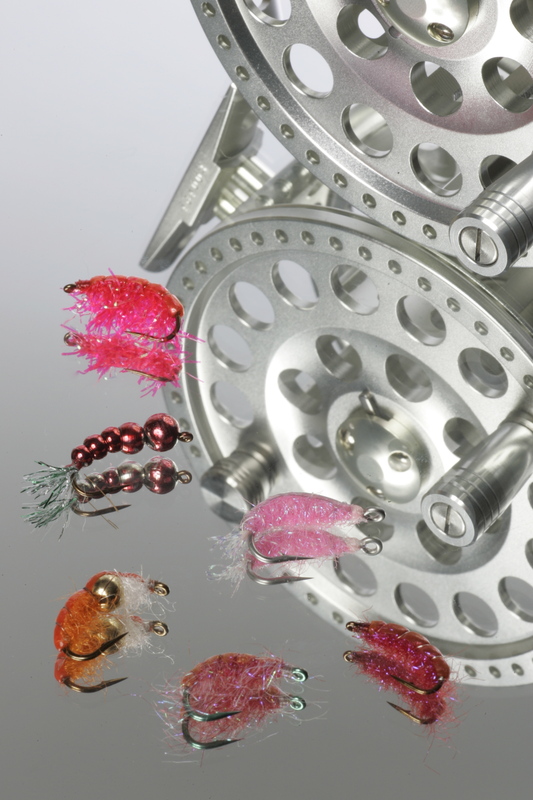 Many fly fishers choose bead head nymphs for fishing like this, but we have a simpler technique, simple by threading the required amount of loose tungsten beads on the leader above the fly. 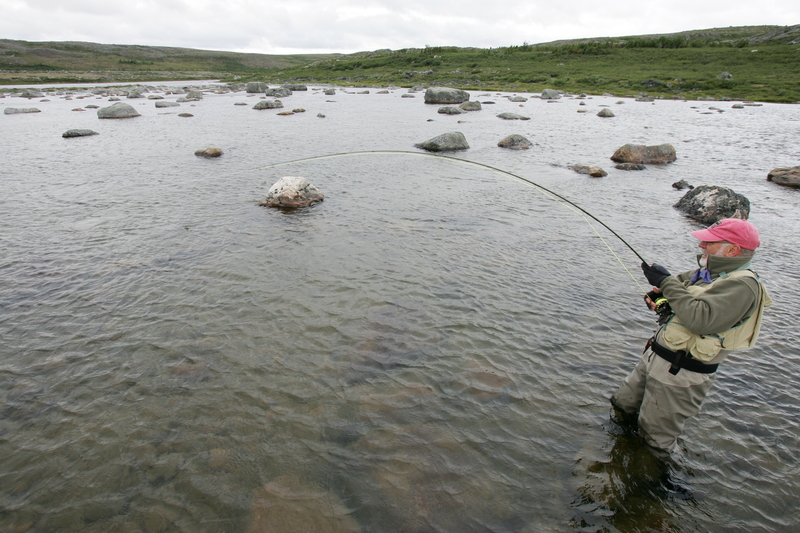 This technique makes it possible to fish more varied and you can manage with much less flies. – 100 % DEET – mosquito jackets, waders and fleece mittens. All geared up. Keeping the black fly and mosquitoes out was essential ! 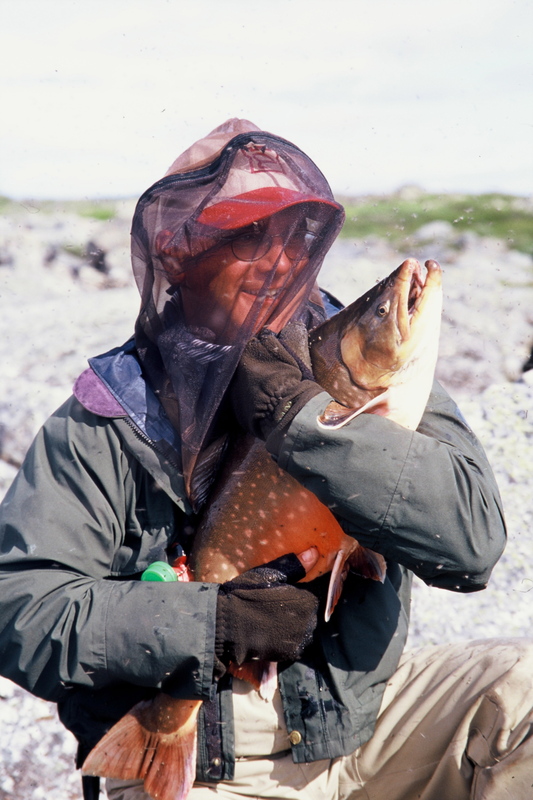 The fishing continued to be fantastic and we experienced that there were two kinds of Arctic char on the way up-to the spawning grounds. The large males who had arrived early in the river and already taken on their spawning colours and fresh run females where a rich silver grey. A large fresh run Char that fell for a size 12 gammarus. The largest fish of the day? yes, Jon played it for a long time, but he eventually lost it, right by his feet without ever being able to get a look at it.! First it ran straight across the current like a sailing boat and confidently stripped meter after meter of fly line from his already screaming reel, until he was down to the last few turns of backing. After a few minutes he managed to pump the the fish closer and put line back onto the reel, I could see Jon´s rod tip bouncing up and down from the fish shaking his head, but when he wanted he made a run stripping more line from my reel. It was a strong as a dolphin and Jon began shouting somthing about saving his fly line! He was worried the fish would break it off and disappear with it. After 15 minutes of hard fighting his rod sprung to attention and his line fell slack. The knot on his fly gave and the heavy leader slipped away. And so did the fish. He later told me that, that was the strongest fish he had ever played…. Standing like this with maximum rod bend we could hear the varnish on the rings and carbon fibre crack in the rod under the strain of these powerful fish. Above the river mouth from the hut, the river runs several hundred meters through large boulders which the last ice-age left there ten thousand years ago. The surface exploded with char on the move. 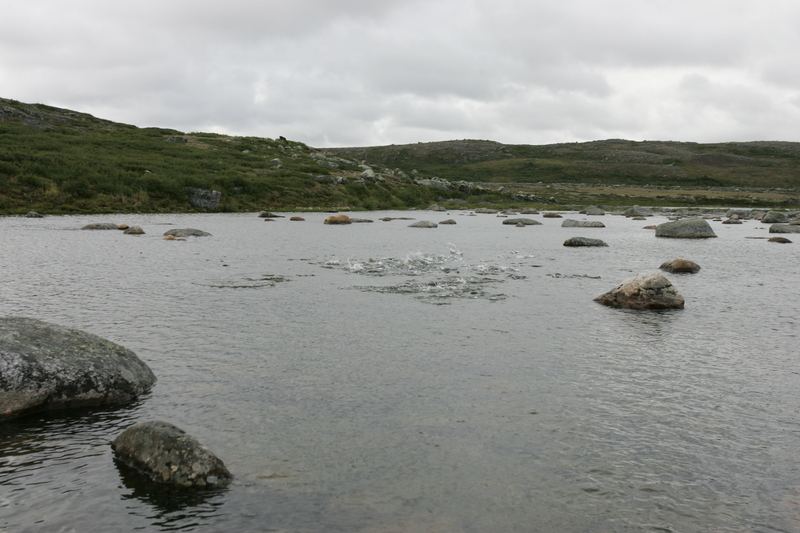 Here the Arctic char follow the deepest runs and pools, where they often stood like bonefish with their fins above the waters surface watching each other like Olympic sprinters at the starting line waiting for the sound of the pistol. And even if their behavior showed that spawning was just around the corner, they willingly took our small bright coloured imitations of gammarus in chartreuse, pink and orange. Here it was a great advantage to stand and fish from the top of large stones as it was impossible to wade and follow a hooked fish.- Some places the bottom was like a garden path of fine shingle, but other places large sharp edged stones. To break a leg out here seemed like not such a good idea. So the tactic was to tighten the brake, lean backwards and hope for a quick raw explosive fight. We hadn´t seen any wild life the first few days, but the first caribou showed itself on a hilltop just above the lower pool. Then there were several more- Soon a flock of cows and calves came between me and the hut. Then on top of the hillside in the east three or four bulls appeared with antlers that would have made Norwegian reindeer hunters stand with open jaws and rub their eyes. The herds of caribou continued to trek for three days and how many thousands of animals passed us is difficult to say. A more detailed check list of equipment is available from the outfitters along with prices and all other information. I will be posting a step by step for the char grub later.